© Posted on November 6, 2017, by Michael E. Newton. 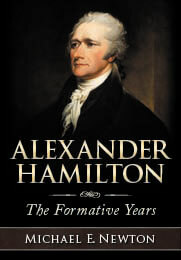 As the editors noted, the above record of February 1768 is “not strictly an H document.” A stricter definition of a Hamilton document would only include documents written, drafted, or signed by Hamilton, or accurate copies of such documents if the originals have been lost, precise contemporary records of his verbal statements such as legal testimony, and letters written to him. According to this definition, the oldest Hamilton document in The Papers of Alexander Hamilton or anywhere else is a letter he wrote to his friend Edward “Ned” Stevens on November 11, 1769 (The Papers of Alexander Hamilton 1:4 and Founders Online). One other “document” must be added to the list of oldest known Hamilton documents. Back in 1858, George Bancroft claimed, “The first written trace of his [Hamilton’s] existence is in 1766, when his name appears as witness to a legal paper executed in the Danish island of Santa Cruz [St. Croix].” In 1899, Henry Cabot Lodge added, “The character of his signature is of more importance than the fact of his affixing it to a deed. I have carefully examined an exact tracing of this signature. The handwriting is obviously Hamilton’s.” However, this document and even Lodge’s “exact tracing” have been lost. Accordingly, we cannot be certain that this “legal paper” was in fact from 1766 or that it was our Alexander Hamilton who signed it. (I have found a ship captain named Alexander Hamilton visiting St. Croix in 1766.) Accordingly, this missing “legal paper” cannot be considered a Hamilton document (and thus the editors of The Papers of Alexander Hamilton chose not to include it in their work). In sum, there are, or have been, three different documents that could be considered the oldest known Alexander Hamilton document. The oldest is from 1766, but the document has apparently not been seen for well over a century and we cannot be certain it is a Hamilton document or that the date given is correct. The second is from February 22, 1768, but this is not strictly a Hamilton document because it merely mentions Hamilton in passing and he had nothing to do with writing it. The third is Hamilton’s letter to Edward Stevens of November 11, 1769. 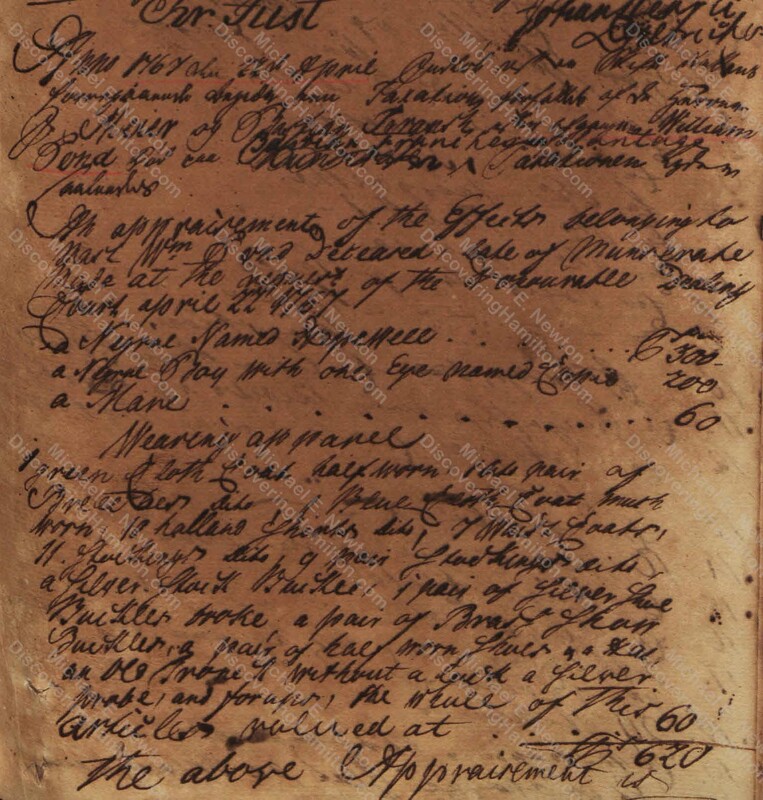 On April 22, 1767, “an appraisal of the effects belonging to Master William Pond Deceased, late of Munserate [Monserrat],” was conducted “at the request of the honourable Dealing Court” of Christiansted, St. Croix. The original document has not been found, but on that same day a copy of the appraisal was entered into the official records of Christiansted. So how do we know if this is our Alexander Hamilton? Like the document itself, the signatures are copies rather than originals, so we cannot compare this signature to known Hamilton signatures (as I recently did for a case currently before the United States District Court regarding the foreign emoluments clause of the Constitution and some Hamilton documents: see here, here, and here). Moreover, both Alexander and Hamilton are misspelled if this is our Hamilton. Furthermore, there were other men named Alexander Hamilton who occasionally visited St. Croix, as mentioned earlier. Maybe this was a different Alexander Hamilton, or even some guy with the completely different name of Allexander Hamilthon. First, regarding the spelling of the name in this record. The name “Alexander” is often found in the Danish West Indian records as “Allexander” and the suffix “ton” often appears as “thon” or “thun.” In records regarding our Alexander Hamilton, his first name is occasionally spelled “Allexander” and his last name “Hamilthon.” So this “Allexander Hamilthon” is merely a Danish alternative spelling of the more common Alexander Hamilton. But this still could be a different Alexander Hamilton. Perhaps in your excitement at seeing “Allexander Hamilthon” you did not notice who else signed the appraisal. (When I first saw this record, I also initially failed to notice the other signatures.) The signature immediately above Hamilthon’s reads “David Beckman” or “David Beekman” (his name is often found with both spellings). For those who don’t immediately recognize that name, David Beekman was one of Alexander Hamilton’s employers on St. Croix. That makes this appraisal of April 22, 1767, the oldest known Alexander Hamilton document. It is older than the letter Hamilton wrote to Edward Stevens in November 1769 and older than the mere mention of Alexander Hamilton in February 1768, as found in the probate record. It is not as old as the supposed 1766 document, but that record is missing and cannot be considered a Hamilton document without further evidence that it was signed by our Alexander Hamilton and that the date is correct. So again, this appraisal of April 22, 1767, witnessed and signed by Alexander Hamilton along with David Beekman, is now the oldest known Alexander Hamilton document. © Feel free to incorporate these new findings in your writings. Please cite this blog post when doing so.